July 27, 1984 Clarence LaVaughn “C. L.” Franklin, minister and civil rights activist, died. Franklin was born January 22, 1915 in Sunflower County, Mississippi. At the age of 16, Franklin became a preacher working the black preaching circuit before settling at churches in Memphis, Tennessee and later Buffalo, New York. 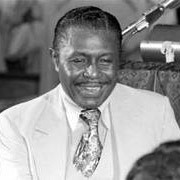 In 1946, he became pastor of New Bethel Baptist Church in Detroit, Michigan. Throughout the 1940s and 1950s, Franklin’s fame grew as he broadcast sermons via radio and preached throughout the country. He was also one of the first ministers to record his sermons. In the 1950s, Franklin became involved in the Civil Rights Movement, working to end discriminatory practices against Black United Auto Workers and organizing the 1963 march for civil rights in Detroit. In 1979, Franklin was shot during an attempted robbery and remained in a coma for five years before his death. The recording of his sermon “The Eagle Stirreth Her Nest” was added to the Library of Congress National Recording Registry in 2011 as “culturally, historically or aesthetically significant.” “Singing in a Strange Land: C. L. Franklin, the Black Church, and the Transformation of America” was published in 2005.